Download Fiscal Fact No. 317: Who Are America’s Millionaires? There is a serious ongoing political debate over the tax rates paid by millionaires. Some say the tax rates paid by wealthy Americans are not progressive enough while others argue that the top rate should be lowered while overhauling the tax code. Neither side of this debate, however, has made any attempt to provide a basic profile of who these taxpayers are. How old are they? What is their marital status? What is their education level? What are their sources of income? In other words, put a demographic face on millionaire taxpayers. According to the latest data from the IRS for 2010, there were roughly 268,000 tax returns reporting more than $1 million in adjusted gross income (AGI), a slight increase above 2009 levels. 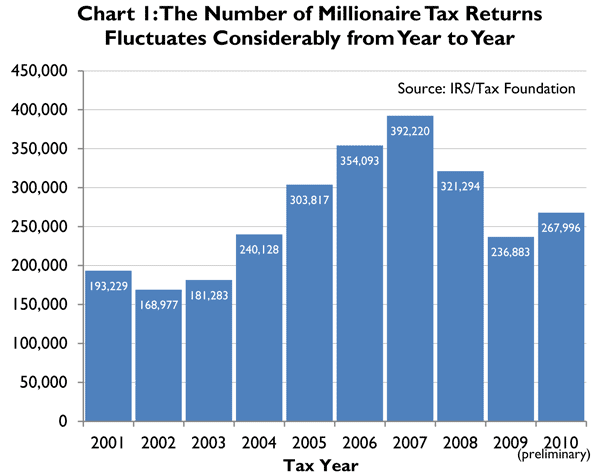 As Chart 1 indicates, however, 2009 had the fewest number of millionaire returns since 2004. Indeed, there were 40 percent fewer millionaire tax returns filed in 2009 than were filed in 2007. 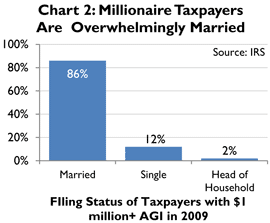 It may surprise many to learn that the majority of taxpayers today are single individuals or heads of household. Just 40 percent of the 140 million tax returns filed in 2009 represented married couples. However, as Chart 2 illustrates, the vast majority of millionaire tax returns (86 percent) were filed by married couples—either jointly or separately. By contrast, there are relatively few single or head of household millionaires—just 12 percent and 2 percent respectively. While the IRS provides no information on how much each spouse contributes to their overall income, Census data does indicate that most high-income couples are two-earner families. 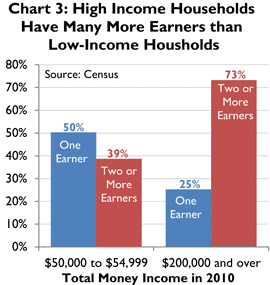 As Chart 3 shows, 73 percent of families with incomes over $200,000 have two or more earners, whereas 25 percent of those high-income families have just one earner. By contrast, half of middle-income families earning between $50,000 and $55,000 have one earner, while 39 percent have two earners. (The remainder have no earners). For most Americans, incomes tend to rise with age and experience. Thus, it is not surprising that in 2009, 80 percent of millionaires were older than age 45 and close to half of all millionaires (46 percent) were older than age 55. As Chart 4 shows, one-third of all millionaires are in their prime working years of 45 to 55, while another 28 percent are in their pre-retirement years of 55 to 65. Moreover, the percentage of millionaires over the age of 65 is slightly larger than those between the ages of 35 to 45. While there has been considerable attention given to the relationship between tax policy and inequality in America, insufficient attention has been given to the linkage between educational attainment and inequality. While IRS data provides no information on the educational attainment of taxpayers at any income level, Census data clearly shows a strong relationship between incomes and education. 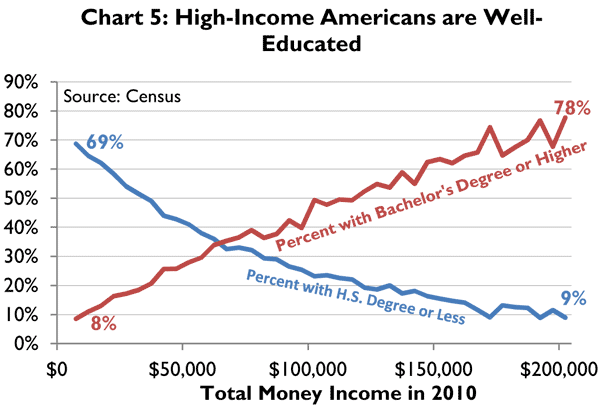 Chart 5 shows that as people’s income rises, so too does the likelihood that they have a college degree or higher. By contrast, those with the lowest incomes are most likely to have a high school education or less. Indeed, just 8 percent of those at the lowest income level have a college degree while 78 percent of those earning $200,000 or more have a college degree or advanced degree. At the other end of the income scale, 69 percent of low-income people have a high school degree or less, while just 9 percent of those earning over $200,000 have just a high school degree or less. In 2009, individual taxpayers reported $896 billion in total business income from all sources, including business and professional income, rents and royalties, partnership and S corporation income, and farm income. After subtracting net losses, individual taxpayers earned $696 billion in net business income. As Table 1 indicates, millionaire tax returns earned 36 percent of all private business income, more than any other income group. By contrast, taxpayers earning between $250,000 and $1 million earned 30 percent all business income, while taxpayers with incomes between $100,000 and $250,000 earned 21 percent. Taxpayers with incomes below $100,000 earned just 13 percent of all private business income. It is also illuminating to look at the distribution of specific types of business income. Table 1 shows the very different distribution of income generated by sole proprietors (business and professional income) versus the income generated by partnerships and S corporations. 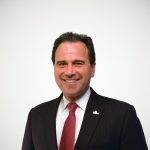 Whereas only 6 percent of sole proprietor income is reported by taxpayers earning over $1 million, more than half (51 percent) of all partnership and S corp income is earned by millionaire taxpayers. Debates over the equity of the tax burden tend to treat millionaires as a monolithic group even though research suggests that there is a significant amount of churning in and out of this elite status. Indeed, a recent Tax Foundation study used special Treasury panel data to look at the mobility of “millionaire” taxpayers between 1999 and 2007. It found a great deal of mobility among the so-called rich. During this nine year period, about 675,000 taxpayers earned over a $1 million for at least one year. 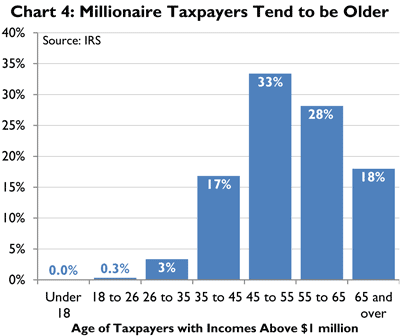 As Chart 6 shows, of these taxpayers, 50 percent (about 338,000 taxpayers) were millionaires for only one year, while another 15 percent were millionaires for only two years. 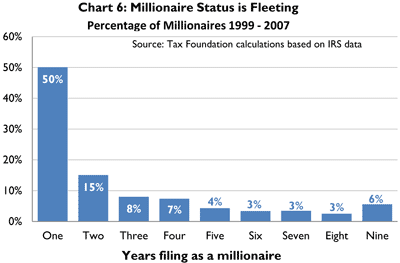 By contrast, just 6 percent (38,000 taxpayers) remained a millionaire in all nine years. Based on these results, it is clear that taxpayers move in and out of millionaire status with great frequency. The volatile nature of capital gains realizations and business income appears to be the leading factors for the transiency of millionaires. IRS data on the so-called Fortunate 400 also shows that even “super” wealthy Americans are not a static elite club that no one can penetrate. Indeed, the report indicates a great deal of churning among the top 400 taxpayers over a 15 year period. Over that period, 3,305 taxpayers had large enough incomes to put them among the Fortunate 400. However, 73 percent of these taxpayers appeared on the list just once and only 15 percent appeared more than twice. In any given year, 40 percent of these taxpayers had never been on the list in any other year. As a group, millionaires have seen a considerable amount of volatility in their incomes over the past decade but have consistently borne a substantial share of the overall income tax burden relative to their incomes and paid at a high average effective tax rate. As Table 2 illustrates, the total income of millionaires grew in nominal terms from $579 billion in 2001 to over $1.4 trillion in 2007—an increase of 142 percent. By 2009, however, the total income of millionaires fell by nearly 50 percent to $727 million, before recovering slightly to $840 billion in 2010. Millionaires’ share of total AGI followed a similar path. In 2001, they earned 9 percent of total AGI and that share grew to 16 percent in 2007. By 2010, however, millionaires’ share of total AGI fell back to 10 percent—about the same level it had been ten years before. Throughout the last ten years, the share of income taxes paid by millionaires has been roughly twice their share of total AGI. In 2001, millionaires paid 18 percent of all federal income taxes. This share grew to 28 percent by 2007 and now stands at 22 percent even though millionaires’ share of the nation’s income has fallen by a greater amount. Despite claims that the tax code has become less progressive, the average effective tax rate of millionaires has remained fairly high throughout the period. Before the full implementation of the Bush-era tax cuts in 2003, the average tax rate paid by millionaires was 29 percent. By 2007, their effective tax rate had fallen to 23 percent, before rising to 25 percent by 2009 and 2010. In the current debate over progressivity in the tax code, there is a tendency on the part of advocates for higher taxes to generalize wealthy Americans as faceless “millionaires” and “billionaires.” However, the portrait of millionaire taxpayers is anything but static. Indeed, the evidence shows that millionaires are an ever-changing group of people who tend to share some common but desirable traits—they are married two-earner couples, who are older, well educated, and America’s business owners. Although there are many definitions of “millionaires,” here we are referring to tax returns with adjusted gross incomes $1 million and above. IRS, Table 1.6 All Returns: Number of Returns, by Age, Marital Status. United States Census Bureau, Current Population Survey, Annual Social and Economic Supplement, http://www.census.gov/hhes/www/cpstables/032011/hhinc/new01_001.htm. Census caps its detailed demographic data at $200,000. This means that families with incomes above this level are blended into this broader income category. For simplicity, we have left out workers with associate’s degrees or some college. Robert Carroll, Income Mobility and the Persistence of Millionaires, 1999 to 2007, Tax Foundation Special Report No. 180 (June 2010), https://taxfoundation.org/article/income-mobility-and-persistence-millionaires-1999-2007. Internal Revenue Service, The 400 Individual Income Tax Returns Reporting the Highest Adjusted Gross Incomes Each Year, 1992-2006, http://www.irs.gov/pub/irs-soi/06intop400.pdf.